Researchers have already developed a series of products based on nanoparticles, some of which have been released for public consumption. Nanotechnology has given rise to house cleaning chemicals that appear to have miraculous effects; the nanoparticles inside these cleaning fluids have been engineered on the molecular level so that when they encounter unwanted dirt or grime, they “eat” it. Housewives everywhere can rejoice in the knowledge that it will soon be common practice to spray the dirt and watch the nanoparticles make it magically disappear. They might also be interested in self-cleaning fabrics. In some cases the nanoparticles inside these materials have been similarly engineered to “eat” stains; in others nano-hairs have been applied in a thin, invisible layer over the fabric itself so that stains cannot penetrate. In both cases, the resulting fabric is either extremely stain-resistant or virtually impossible to soil. Most of these successes have been with wool and silk, but other fabrics are being stain-proofed daily. Eddie Bauer has already released a line of stain-proof khakis. But perhaps the timeliest use for nanoparticles lies in their medical applications. 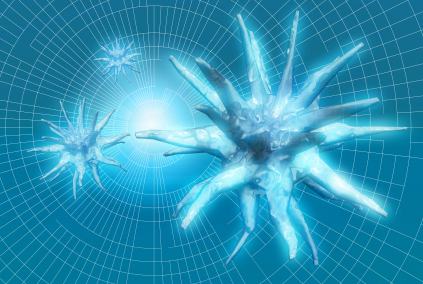 Their pathogen-sized proportions naturally make them prime candidates for the fight against various unwanted invaders of the human body; they can be injected into your bloodstream to fight viruses and bacteria in much the same way as your immune system’s helper-T cells do. This can either give you a much-needed boost, or in the case of AIDS sufferers it may make the difference between life and death. For those with severe auto-immune diseases like HIV and AIDS, nanoparticles could essentially serve as a synthetic immune system. It seems likely that nanoparticles will also be key players in the fight against cancer. Our current cancer treatments tend to be traumatic and painful for the patient while at the same time providing unpredictable levels of success, especially when it comes to chemotherapy. Chemotherapy uses the bloodstream, and—as the name “circulatory system” suggests—this method of transportation distributes the lethal chemical throughout several parts of the body in its quest to find the cancer’s location. By doing so, it kills off healthy, useful cells along with malignant tumors. And since the chemical dosage is typically not fine-tuned to the molecular level, some cancer cells may still survive this treatment. If even one malignant cell lives and makes a comeback, then the chemotherapy will have been a painful and costly failure. But nanoparticles can be equipped with sensors and cameras as well as cancer-killing drugs. They would then be able to swim through the bloodstream, using their sensors to locate the exact site of the cancer where it grows. Their cameras could beam back images to doctors and nurses, or in some cases the nanoparticles could also be equipped with fluorescent markers and/or iron oxide cores so that they can be located on both optical imaging devices and MRI. In essence, researchers could track these tiny particles as they make their way through the human system and deliver doses of anti-cancer drugs to the cancer site, killing off every last molecule of the tumor without painful side effects or unnecessary damage. This would not only make cancer treatment much less uncomfortable for patients, but also faster and more effective. Optical. Nanoparticles could be engineered and used for anti-reflection product coatings, producing a refractive index for various surfaces, and also providing light based sensors for use in diagnosing cancer. Magnetic. Nanoparticles have the potential to increase the density of various storage media, and also when magnetized they can improve the detail and contrast of MRI images as previously alluded to. Thermal. Specifically engineered particles could improve the transfer of heat from collectors of solar energy to their storage tanks. They could also enhance the coolant system currently used by transformers in these types of processes. Mechanical. Nanoparticles could provide improved wear and tear resistance for almost any mechanical device. They could also give these devices previously unseen anti-corrosion abilities, as well as creating entirely new composites and structural materials that are both lighter and stronger than those we use today. Electronic. Because of their tiny size, nanoparticles are inherently poised to aid in the production of high performance delicate electronics; they may provide not only materials with a high rate of conductivity, but also sleeker parts for small consumer electronics like cell phones. And when it comes to advertising, nanoparticle electronics can create digital displays that are more electricity-efficient, less expensive to produce, brighter in color, and also bigger. Energy. Nanoparticle batteries would be longer-lasting and have a higher energy density than those we use today. Metal nanoparticle clusters could also have revolutionary applications for hydrogen storage; they could also produce extremely efficient fuel cells by acting as electrocatalysts for these devices. Nanoparticles may also pave the way for practical and renewable energy; they have already demonstrated an ability to improve solar panel efficiency many times over. Not only that, but when nanoparticles are used as catalysts in combustion engines, they have shown properties that render the engine more efficient and therefore more economic. Biomedical. You may soon find that your wounds are dressed with antibacterial coatings of silver nanoparticles. Nanoparticles have also been used to produce “quantum dots,” which can detect diseases, as well as interactive foods and drinks that change flavor and color based on your tastes, or in some cases may even alter their nutrient content based on your state of health. This entry was posted on August 3, 2009, 3:40 am and is filed under nanoparticles. You can follow any responses to this entry through RSS 2.0. You can leave a response, or trackback from your own site.